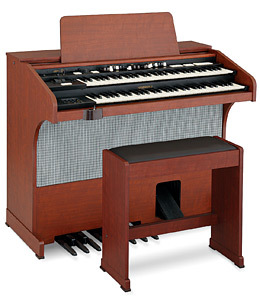 The A405SP is a wooden cabinet Organ featuring the traditional Drawbar sounds of a vintage Hammond Organ, realistic Extra voices, and a convenient MIDI sequencer onboard. Advanced Digital Leslie / Vibrato Effects – The A-405SP is equipped with a DSP effect generator to simulate the Scanner-Vibrato and Leslie Speaker. The range of sound that you can create is expanded by the use of Vibrato and chorus effects and by the the real sounding Leslie effects which effectively simulates the rotation of the rotors which are present in traditional Leslie Speakers. Equalizer and Tone Control – A 3-band equalizer and tone control are built in. The equalizer can make fine or course tonal adjustments to the bass, treble and mid frequency ranges. The Tone-control simulates the circuit built in on the vintage B-3/C-3 pre-amp to obtain a gently-cut treble. Sequencer with CompactFlash card slot – A sequencer is built in for recording the player’s performance. The CompactFlash card is used to record the performance data. MIDI Master Keyboard – An external zone is available on each manual and pedalboard to enable this organ to be used as a master keyboard to control other external MIDI keyboards or sound devices. 50 watt 3 CH Audio Amplifier – Built in a 50 watt Power Amp for each hannel of Left, Right and Centre Bass.